The acoustic thing is a bit of a departure for me, having spent most of my musical career as a semi-professional rock musician. I’ve always had an acoustic at home however, and half-learned some songs that I liked but that never fit into a rock band format. These tunes form the basis of what I do with Nick. Nick found me by chance when I was playing with a musical acquaintance. This coincided with me, desperately short of money, just starting out in an acoustic solo spot at The Pembroke in Southsea. Nick was at a loose end musically and had turned down a few offers, nothing really appealed. It was his idea that we form a duo. 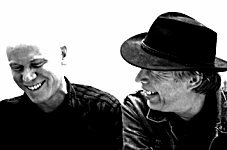 I particularly like playing with Nick, not only because he’s a sympathetic and experienced player, but his instruments, predominantly pedal-steel guitar and mandolin, give the duo a novel sound. I like to try things no right-thinking acoustic act would attempt. Whilst others might play safe with more mellow and traditional material, it pleases me to have a go at songs by the likes of Erasure and The Rolling Stones. It seems to work.